Sanaa, Yemen - Hundreds of thousands of Yemenis packed a square in the capital and marched in villages and cities across the nation on Friday in what appeared to be the largest demonstrations in more than a month of demands the country’s longtime ruler Ali Abdullah Saleh step down. Youth leaders said they planned a march in the direction of the heavily guarded presidential palace. Many mosques in the capital shut down — a move unprecedented for Friday, the Muslim day of prayer — as worshippers and clerics streamed to the square outside Sanaa University. Protesters filled the plaza and spilled out along three adjoining streets. Previous demonstrations have taken up the square and at most two of the streets that feed into it. The demonstrators set up tents and hung up posters of young men who were fatally shot by government forces during previous protests. In a parallel demonstration, tens of thousands of government supporters rallied to al-Sabaeen Square outside the presidential palace, where Saleh made a brief speech, telling them, “With my blood and soul, I redeem you,” a common chant in the Arab world. Saleh has ruled Yemen for 32 years. 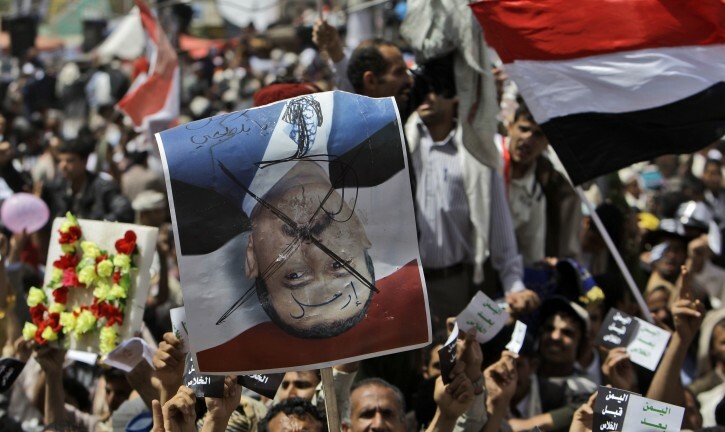 He warns that if he is ousted, Yemen will descend into chaos, boosting the al-Qaida presence already in the country. On Friday evening, two local newspaper reporters and a television cameraman were detained by security forces, according to Gamal Anaam, member of the Yemeni journalists’ union. A security official declined to comment. Security forces also seized a close aide to Maj. Gen. Ali Mohsen al-Ahmar, a top military commander and longtime confidant of the president who joined the opposition. The aide, Abdul-Ghani al-Shimiri, who is al-Ahmar’s political and media assistant, was detained outside his Sanaa home Friday and is being held by the National Security agency, according to a statement by al-Ahmar’s office. Al-Ahmar’s was the most significant in a wave of defections from Saleh’s regime by military commanders, ruling party members and others, swelling the ranks of the opposition and leaving him isolated. Al-Ahmar, commander of the powerful 1st Armored Division, deployed his troops at the central square, where demonstrators gather. 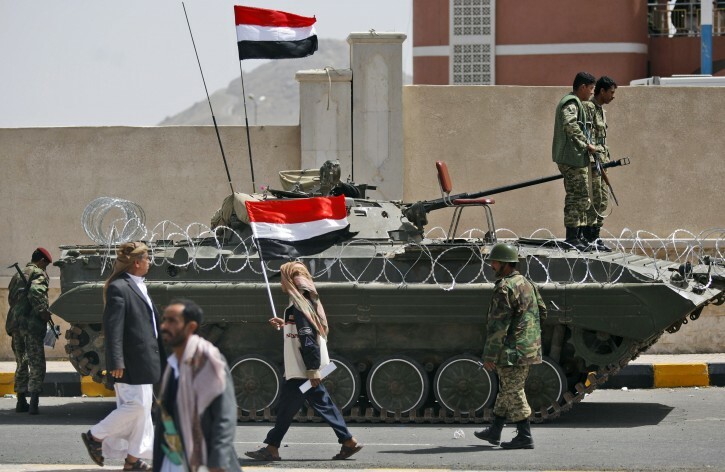 Saleh escalated his confrontation with the rapidly expanding uprising a week ago, taking on emergency powers that give him a freer hand to quell protests. Parliament, which is packed with his supporters, passed a 30-day state of emergency that suspends the constitution, bars protests and gives security forces far-reaching powers of arrest. In another development, plainclothes militias were seen taking up positions around the capital. An army officer said the militias are under the command of Saleh’s son and are designed to be deployed quickly to trouble spots. He spoke under condition of anonymity because of the sensitivity of the issue. In a failed attempt to appease the protesters, Saleh offered not to run again when his current term ends in 2013. He then offered to step down by the end of this year and open a dialogue with the leaders of the demonstrators. Protesters rejected all his offers, furious after his security forces shot dead more than 40 demonstrators in Sanaa last month. 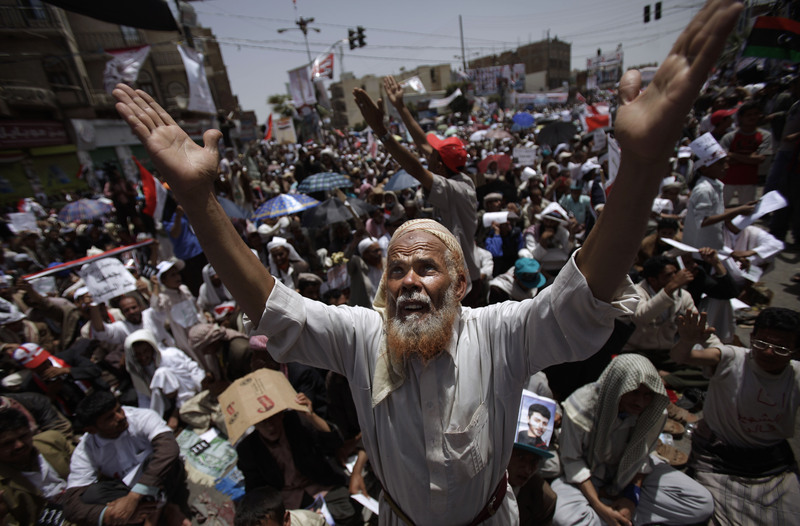 On Friday, there were anti-Saleh protests in at least 14 other provinces around the country. Witnesses said hundreds of thousands of people attended demonstrations in the provinces of Aden, Taaz, and Hadramout. The Sanaa crowd was supported by soldiers with anti-aircraft guns and Kalashnikov rifles, who set up half a dozen checkpoints around the square to prevent intrusions by president’s loyalists. 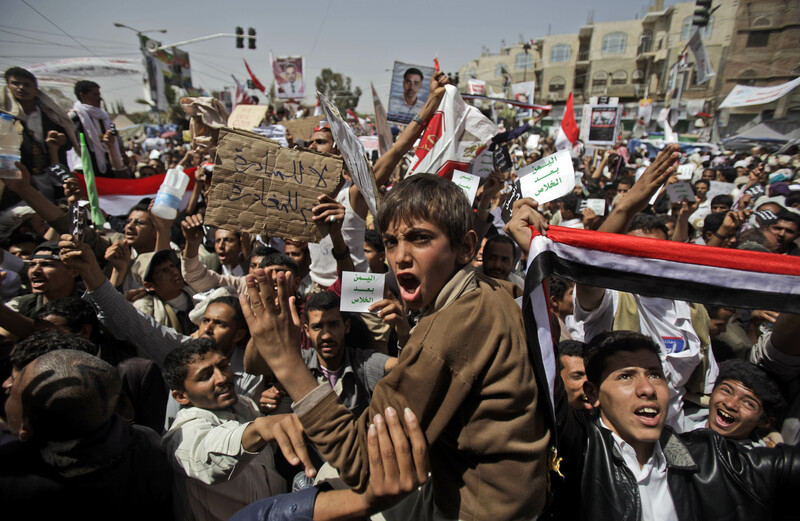 Protesters, who have called for a “Friday of Salvation,” raised black cards while chanting “Ali Leave!” Women and children, their faces painted in the colors of the Yemeni flag, or the word “Leave,” joined the protests. Cleric Taha al-Moutawkel told the crowd during afternoon prayers that Saleh’s regime was already collapsing, and he vowed that the protests will remain peaceful. He said that even if the West backs Saleh, the people will keep pushing for his ouster. “If the president’s popular legitimacy plunges, no any power in the West or the East can bring him back,” he said. The demonstrators blame Saleh for mismanagement, repression and the fatal shootings of protesters. They say they will not relent until he goes.